New York has been experiencing a heat wave the past 2-3 weeks and it's starting to get on my nerves. I was good at first; I felt like the summer and warm weather was refreshing. I wasn't hot too often and didn't feel the need to complain or stress about the heat -- it was a really nice change of pace for me. However, once Mother Nature felt the tides turning and knew August was on its way, she geared up and changed course. It has been incredibly hot the past few weeks and especially the last 4-5 days. It is pretty unbearable and the city has issues heat advisories almost every day. It's really bad out there, folks, and doesn't seem to be getting better. That being said, I've taken my already minimal summer makeup down a notch. I am going almost bare face every day at work because the walk to the subway as well as standing on the subway platform does nothing for my makeup. 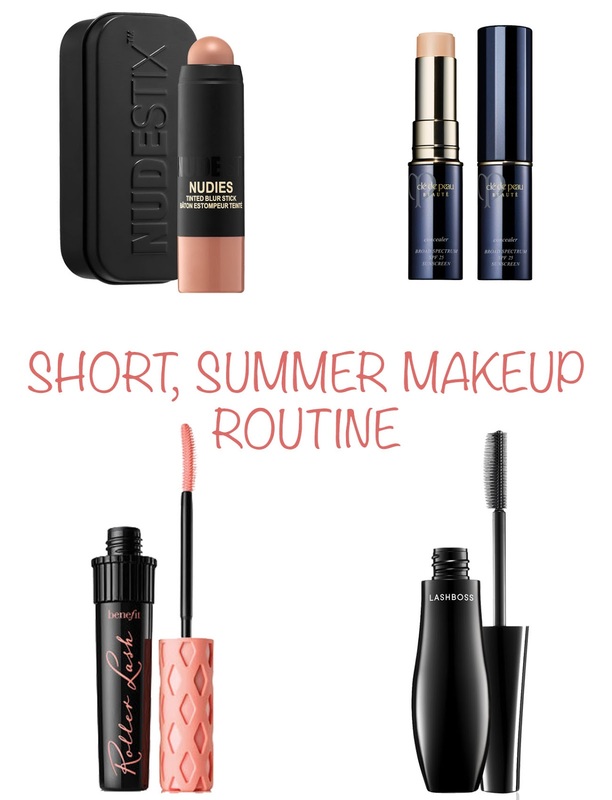 I figured with one month left of summer and who knows how much hot weather left, I'd share my current, very short summer makeup routine. 1. Nudestix Tinted Blur Stick: I talked about this in my July favorites but I wear this pretty much every day -- without primer (the HORROR) and it keeps me nice and matte, provides a little coverage and feels light on the skin. It's not as heavy as a regular stick foundation and has a silicone feel, which lends itself to the matte feeling. It's the ultimate summer companion and I'm very grateful for it. 2. Clea De Peau Concealer: I've raved about this concealer before but it's my summer must-have. The last thing I want to do is blend in a liquid concealer that is going to melt off my skin the moment I step foot outside. I opt for my full coverage cream concealer that can easily be blended out with your finger and used almost like a foundation because it's that full coverage. It also stays put (most of the time) all day so that's a definite plus. 3. LashBOSS or Rollerlash Mascara: These have been my favorite mascaras for a long time and they're my summer favorites at the moment. I switch between them on a daily basis and really like them both the same. LashBOSS provides more lengthening and volume while Rollerlash is great at separating but honestly, they both are similar and I'm obsessed. They aren't waterproof but I don't experience any smudging with either one. 4. Lipstick or gloss: Matte lipstick is a no-no for me during a heatwave so I opt for a balm, gloss or lipstick. Below are a few of the favorites that I've been alternating between. If I want to keep everything super simple but want a little more 'oomph' I'll add cream blush and/or highlight. Below are my must-haves and I can't get enough!